All Tobii Pro eye trackers include cameras that must be able to take pictures of the participants face and eyes to be able to track where they are looking. This also means that an eye tracker works in a smiliar ways as any camera and has the same limitations. For the eye tracker to work the participants eyes must fit within the pictures taken by the eye tracker ie. they must be within a certain distance from the eye tracker and nothing should block the eye tracker from taking a good picture. At least one eye has to be within the trackable area at all times. For optimal eye tracking the distance from the participant’s eyes to the eye tracker should be approximately 60–65 cm (23–26″) for most screen based eye trackers from Tobii Pro. However, the eye tracker can still track the eyes as long as the participant stays within the distance interval mentioned in the product specification for your eye tracker. 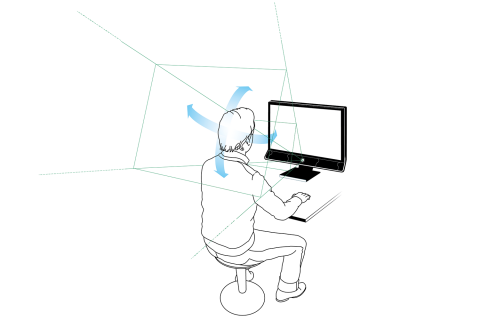 Usually the distance is between 50 cm (20") to 80 cm (31") depending on eye tracker model. When you setup the test station and when you place the participant in front of the eye tracker always place the participant at approximately 65 cm (26") away from the eye tracker before calibration. Like this the participant is placed in the middle of the trackable area which offers better tolerance for head movements. All Tobii Pro screen based eye trackers tolerate head movements, how much varies depending on the eye tracker model (see the eye tracker specifications for an indication of how much the participant can move while being tracked) Head movements performed during a recording, especially rapid head movements, will still however have an impact on the eye tracking data quality. You can find out the approximate distance from the participant to the eye tracker by looking at the Track Status feature in Tobii Pro Studio or Tobii SDK. The Track Status is always displayed as part of the calibration procedure. Before calibration, make sure the participant is in a comfortable posture they can maintain for the duration of the test. The participant's face should be parallel to the screen and both should start in a vertical orientation. Look at the Track Status window and verify that it shows two stable eye indicators with both positioning guides green with an optimal target distance of of 65 cm. Make sure the participant can comfortably read text, if any, and reach the keyboard and mouse if these are to be used during the experiment. It is also important to have the correct distance between the eye tracker and the monitor or the object to be tracked. If you place the eye tracker farther away from an object you can track larger objects, if you place the eye tracker closer to the object you can track smaller objects. When a Tobii Pro X-series eye tracker is used in a setup where it is not attached directly to a screen, it should be placed below the monitor (or below the surface that is to be used for presenting the stimuli) without covering the bottom of the display area for the participant watching the stimuli. 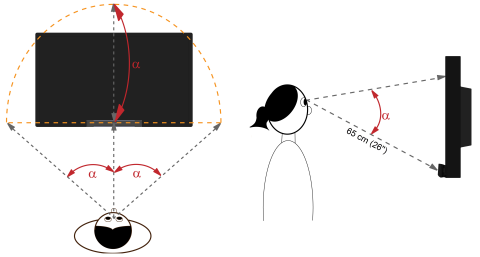 For most X-series eye trackers, the eye tracker should be placed so that the gaze angle (α) illustrated above will not exceed 35-36° (see eye tracker specifications) when the participant is located ~65 cm (26’’) from the eye tracker. The correct distance and the maximum screen size can be calculated by using basic trigonometry. By assuming that the tracked area is a half circle and that the diagonal from the center of the screen or other stimuli to its top corner constitutes the radius of that half circle, it is possible to calculate the distance needed between the participant and the stimuli using the basic trigonometry. For example for the Tobii Pro X2-30 and X2-60 the maximum recommended screen sice when the eye tracker is attached directly to a monitor is 25". See the User's Manual for your eye tracker for more information about how large objects can be tracked successfully.